Open-source hardware (OSH) consists of physical artifacts of technology designed and offered by the open-design movement . Both free and open-source software (FOSS) and open-source hardware are created by this open-source culture movement and apply a like concept to a variety of components. It is sometimes, thus, referred to as FOSH (free and open-source hardware). The term usually means that information about the hardware is easily discerned so that others can make it – coupling it closely to the maker movement. Hardware design (i.e. mechanical drawings, schematics, bills of material, PCB layout data, HDL source code and integrated circuit layout data), in addition to the software that drives the hardware, are all released under free/libre terms. The original sharer gains feedback and potentially improvements on the design from the FOSH community. There is now significant evidence that such sharing can drive a high return on investment for the scientific community. Open-source hardware also helps alleviate the issue of proprietary device drivers for the free and open-source software community, however, it is not a pre-requisite for it, and should not be confused with the concept of open documentation for proprietary hardware, which is already sufficient for writing FLOSS device drivers and complete operating systems. The difference between the two concepts is that OSH includes both the instructions on how to replicate the hardware itself as well as the information on communication protocols that the software (usually in the form of device drivers) must use in order to communicate with the hardware (often called register documentation, or open documentation for hardware), whereas open-source-friendly proprietary hardware would only include the latter without including the former. ... those who benefit from an OHL design may not bring lawsuits claiming that design infringes their patents or other intellectual property. Organizations tend to rally around a shared license. For example, OpenCores prefers the LGPL or a Modified BSD License, FreeCores insists on the GPL, Open Hardware Foundation promotes "copyleft or other permissive licenses", the Open Graphics Project uses a variety of licenses, including the MIT license, GPL, and a proprietary license, and the Balloon Project wrote their own license. Other authors, such as Joshua Pearce have argued there is an ethical imperative for open-source hardware – specifically with respect to open-source appropriate technology for sustainable development. In 2014, he also wrote the book Open-Source Lab: How to Build Your Own Hardware and Reduce Research Costs, which details the development of free and open-source hardware primarily for scientists and university faculty. A new scientific journal has also been introduced by Prof. Pearce in partnership with Elsevier: HardwareX. 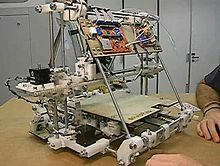 It has featured numerous examples of applications of open source hardware for scientific purposes. ^ C. Priavolou, "The Emergence of Open Construction Systems: A Sustainable Paradigm in the Construction Sector? ", Journal of Futures Studies 23(3), pp. 67-84 (2018). ^ Alicia Gibb (Ed.) Building Open Source Hardware: DIY Manufacturing for Hackers and Makers, Addison-Wesley: New York, pp. 253–277 (2015). ^ "Free Hardware and Free Hardware Designs". Free Software Foundation Inc.
^ Joshua M. Pearce. (2015-06-20). "Return on Investment for Open Source Hardware Development". Science and Public Policy. 43 (2): 192–195. doi:10.1093/scipol/scv034. ^ a b Theo de Raadt (2016-12-03). Open Documentation for Hardware. OpenCON 2006, 2–3 December 2006. Courtyard Venice Airport, Venice/Tessera, Italy. ^ Constantine A. Murenin (2006-12-10). "Почему так важно иметь документацию по программированию железа". Linux.org.ru (in Russian). ^ Perens, B. 1997. Announcing: The Open Hardware Certification Program. Debian Announce List. .
^ The Open Hardware Certification Program on openhardware.org (November 1998). ^ Freeman, D. 1998. OHSpec: The Open Hardware Specification Project. ^ McNamara, P. 2007a. “Open Hardware”. The Open Source Business Resource (September 2007: Defining Open Source). "Archived copy". Archived from the original on 2012-01-06. Retrieved 2016-03-05. CS1 maint: Archived copy as title (link). ^ a b Ars Technica: TAPR introduces open-source hardware license, OSI skeptical. ^ Freedom Defined. 2011. Open Source Hardware Definition. Freedom Defined. .
^ CERN launches Open Hardware initiative Archived 2012-07-01 at the Wayback Machine. CERN. 2011. ^ Ayass, M. 2011. CERN's Open Hardware License Archived 2011-12-06 at the Wayback Machine. ^ Bruce Perens, 2011a. Promoting Open Hardware. ^ Bruce Perens. 2011b. Open Hardware – Constitution. Open Hardware. ^ You've reached a web site owned by Perens LLC on openhardware.org. ^ An Important Question on the Open Source Hardware Mark on oshwa.org (August 2012). ^ co-existence on oshwa.org (October 2012). ^ Replicant – Freedom and privacy/security issues [online]. (2016). Available from http://www.replicant.us/freedom-privacy-security-issues.php. (Accessed 02/22/2016) "The freedom to use the hardware, for any purpose. The freedom to study how the hardware works, and change it so it works as you wish. Access to the hardware design source is a precondition for this. The freedom to redistribute copies of the hardware and its design so you can help your neighbor. The freedom to distribute copies of your modified versions to others. By doing this you can give the whole community a chance to benefit from your changes. Access to the hardware design source is a precondition for this". ^ a b c Bonvoisin, Jérémy; Mies, Robert; Boujut, Jean-François; Stark, Rainer (2017-09-05). "What is the 'Source' of Open Source Hardware?". Journal of Open Hardware. 1 (1). doi:10.5334/joh.7. ISSN 2514-1708. ^ "Open Source Hardware (OSHW) Definition 1.0". Open Source Hardware Association. 2012-05-26. ^ "start [RetroBrew Computers Wiki]". www.retrobrewcomputers.org. Retrieved 2017-11-17. ^ "S100 Computers - Cards For Sale". s100computers.com. Retrieved 2017-11-17. ^ "Xi 8088 - Malinov Family Web Presence". www.malinov.com. Retrieved 2017-11-17. ^ "XTIDE project". Vintage Computer Forum. Retrieved 2017-11-17. ^ "Lo-tech Memory Boards - lo-tech.co.uk". www.lo-tech.co.uk. Retrieved 2017-11-17. ^ "Lo-tech Audio Boards - lo-tech.co.uk". www.lo-tech.co.uk. Retrieved 2017-11-17. ^ "Obsolescence Guaranteed". Obsolescence Guaranteed. Retrieved 2017-11-17. ^ Chiu, S. H. and Urban, P. L., 2015. Robotics-assisted mass spectrometry assay platform enabled by open-source electronics. Biosensors and Bioelectronics, 64, p. 260–268. ^ Chen C.-L., Chen T.-R., Chiu S.-H., and Urban P.L., 2017. Dual robotic arm “production line” mass spectrometry assay guided by multiple Arduino-type microcontrollers. Sensors and Actuators B: Chemical 239, p. 608-616. ^ Urban P.L. 2015, Universal electronics for miniature and automated chemical assays. Analyst 140, p. 963-975. ^ Prabhu G.R.D. and Urban P.L. 2017, The dawn of unmanned analytical laboratories. Trends in Analytical Chemistry 88, p. 41-52. ^ Kate, Jelle ten; Smit, Gerwin; Breedveld, Paul (3 April 2017). "3D-printed upper limb prostheses: a review". Disability and Rehabilitation: Assistive Technology. 12 (3): 300–314. doi:10.1080/17483107.2016.1253117. ISSN 1748-3107. PMID 28152642. ^ From OpenCollector's "License Zone" Archived 2008-12-05 at the Wayback Machine: GPL used by Free Model Foundry and OpenSPARC; other licenses are used by Free-IP Project, LART (the software is released under the terms of the GNU General Public License (GPL), and the Hardware design is released under the MIT License), GNUBook (defunct). ^ Thompson, C. (2011). Build it. Share it. Profit. Can open source hardware work?. Work, 10, 08. ^ "The TAPR Open Hardware License". Retrieved 16 April 2015. ^ "CERN Open Hardware Licence". Open Hardware Repository. CERN. 2012-07-05. Archived from the original on 2015-09-24. Retrieved 2012-08-15. ^ "Open Hardware Repository". Retrieved 16 April 2015. ^ "Solderpad licenses". Solderpad.org. Retrieved 2012-08-15. ^ FAQ on oshwa.org "What license should I use? In general, there are two broad classes of open-source licenses: copyleft and permissive. Copyleft licenses (also referred to as “share-alike” or “viral”) are those which require derivative works to be released under the same license as the original; common copyleft licenses include the GNU General Public License (GPL) and the Creative Commons Attribution-ShareAlike license. Other copyleft licenses have been specifically designed for hardware; they include the CERN Open Hardware License (OHL) and the TAPR Open Hardware License (OHL). Permissive licenses are those which allow for proprietary (closed) derivatives; they include the FreeBSD license, the MIT license, and the Creative Commons Attribution license. Licenses that prevent commercial use are not compatible with open-source; see this question for more." ^ "Recommended Licenses - Open Hardware Wiki". ^ "The Open Source Hardware Bank | Make". Make: DIY Projects and Ideas for Makers. 2009-03-05. Retrieved 2017-09-09. ^ Gacek, C.; Arief, B. (January 2004). "The many meanings of open source". IEEE Software. 21 (1): 34–40. CiteSeerX 10.1.1.584.5392. doi:10.1109/MS.2004.1259206. ISSN 0740-7459. ^ (1), Bonvoisin, Jérémy; (2), Thomas, Laetitia; (1), Mies, Robert; (2), Gros, Céline; (1), Stark, Rainer; (2), Samuel, Karine; (1), Jochem, Roland; (2), Boujut, Jean-François (2017). "Current state of practices in open source product development". DS 87-2 Proceedings of the 21st International Conference on Engineering Design (ICED 17) Vol 2: Design Processes, Design Organisation and Management, Vancouver, Canada, 21-25.08.2017. ISSN 2220-4342. ^ Staff, Wired. "Free, as in Beer". WIRED. Retrieved 2017-09-09. ^ Benjamin Tincq (2014-11-15). "Business Models for Open Source Hardware". ^ "Best Practices for Open-Source Hardware 1.0". Open Source Hardware Association. 2012-11-21. Retrieved 2017-09-09. ^ McAloone, Asta Fjeldsted, Gudrun Adalsteinsdottir, Thomas J. Howard and Tim (2012). "Open Source Development of Tangible Products". DS 71: Proceedings of NordDesign 2012, the 9th NordDesign Conference, Aarlborg University, Denmark. 22-24.08.2012. ^ Open Source Product Development - The Meaning and Relevance of | Kerstin Balka | Springer. Forschungs-/Entwicklungs-/Innovations-Management. Gabler Verlag. 2011. ISBN 9783834931535. ^ Pearce, Joshua M. (2017-03-21). "Emerging Business Models for Open Source Hardware". Journal of Open Hardware. 1 (1). doi:10.5334/joh.4. ISSN 2514-1708. ^ Joshua Pearce. "Pearce Research Group - Current Projects". Retrieved 16 April 2015. ^ Pawel Urban. "Urban Lab at NTHU". Retrieved 16 November 2017. ^ Pearce, Joshua M. (2017). "Emerging Business Models for Open Source Hardware". Journal of Open Hardware. 1. doi:10.5334/joh.4. ^ Saddlemire, Katie (14 April 2015). "What does "Open Source" mean?". littleBits. littleBits. Retrieved 26 May 2015. ^ "Build It. Share It. Profit. Can Open Source Hardware Work?". WIRED. 2008-10-20. Retrieved 16 April 2015. ^ Byfield, Bruce. "Crowd Supply Boosts Open Hardware » Linux Magazine". Linux Magazine. Retrieved 2017-04-13. ^ a b Richard Stallman (2015-03-11). "Why We Need Free Digital Hardware Designs". Wired. Wired. Retrieved 2016-01-14. ^ Joshua M. Pearce, "The Case for Open Source Appropriate Technology", Environment, Development and Sustainability, 14, p. 425–431 (2012).